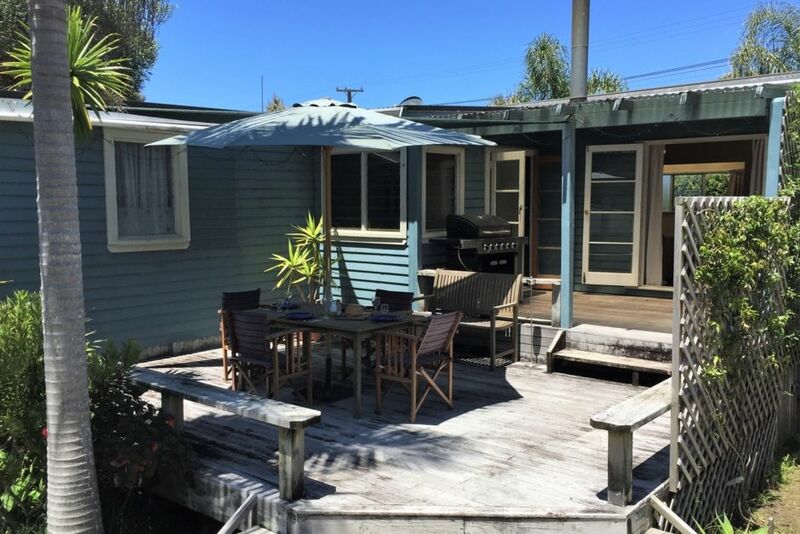 Palm Beach is a lovely Kiwi bach located within the golden circle of Mangawhai Heads. Situated on a private sunny section, there is a large sheltered deck ideally suited to outdoor entertaining, gas BBQ and outside furniture are also included. The Bach has 1 room with a double bed and a second room with a double bed with a single bunk above. We have a fold out couch, 2 roll out beds (or airbeds are available) which can be used in the lounge, or there is space for tents. It's a 5min walk down to the estuary and a short drive to the ocean beach if you are looking for some waves. It's also within walking distance to the shops, cafes and golf course. There is plenty to do in and around Mangawhai, with fishing, diving, golf, surfing, sailing, water sports, walks and easy travel to Waipu Cove, Langs or Te Arai Point. A wonderful family bach which we hope you enjoy as much as we do. Special conditions: Minimum 2 night stay. We had a lovely short break here with our kids. The place is quite basic but adequate if you aren't looking for luxury. The track down to the water is pretty steep and slippery so you may need to drive or take a long road walk to get there. However it was perfect for us as we were after simple weekend family holiday with our dog to go walking and play board games. So happy with this place. It is a classic kiwi Bach - the minute you come inside you feel like you are on holiday. It’s spotlessly clean, simple and spacious inside. It has a large living room, kitchen with everything you need and a spacious deck with a big bbq. Loads of board games kept my teenagers and I entertained. You can walk to the estuary or less than 5 mins drive to Mangawhai Heads beach. There are lots of beautiful beaches in easy driving distance. The kids ran 12 km to Waipu Cove where we enjoyed a delicious breakfast and swim in the surf. I really needed to get away to relax for the weekend and this bach was perfect. Being able to bring our well behaved spoodle was much appreciated. Also James accommodated our requested check in and check out times. He was very quick in replying to my emails. This reasonably priced kiwi Bach is a real gem. We will be back. Thanks James. The location of the bach is good i.e. less than 10 minutes to the shops and beach. Also the outside area is nice and large. However, there was no fans in the bach and it was very hot. Also there was no washing line to hang wet towels and no tea and coffee provided. The decor was dated and I felt for the price it was not up to standard. Bach is in good location and suited our family of two kids and a dog well. Many thanks!